Research practitioners and sites in your area. Use a basic Google search, LinkedIn, family members, friends, your school’s career center or alumni network, or even the phone book to compile a list of four or five local sites/therapists you could observe. If you are having trouble finding places to shadow, you might also find it helpful to get in touch with members of your local or state Occupational Therapy Association who can connect you with clinicians in your area. This list will vary greatly based on your geographic location, access to transportation, schedule, etc. 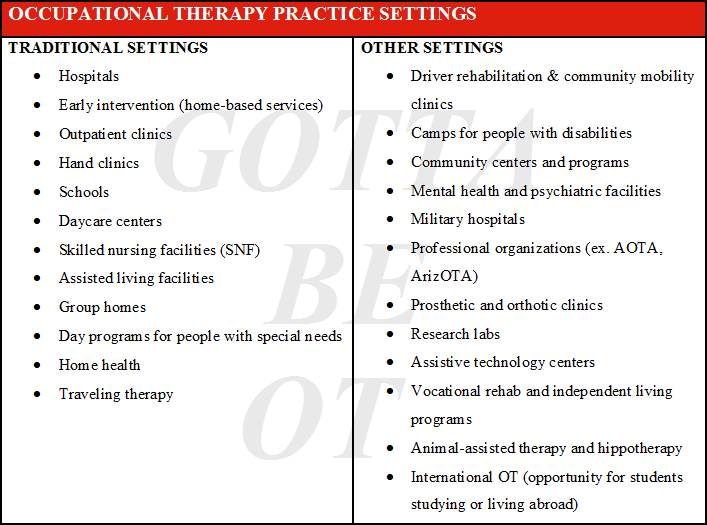 The following table is a list of “traditional” and “non-traditional” settings where OTs typically work, to get you started in your search. While this is a fairly comprehensive list of places where OTs work, doing a Google search for OTs in your area might turn up some practitioners who are doing work in settings you might not expect! 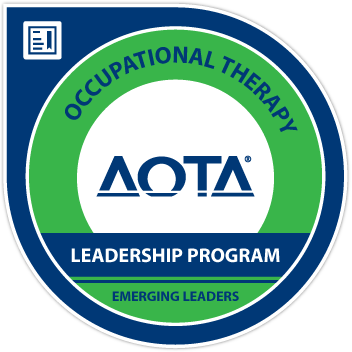 For example, although OTs are not typically found on college campuses, there are clinicians at the University of Southern California who are providing OT services to college students with their Lifestyle Redesign program. Choose a population and setting. Once you’ve made your list of local therapists, you’ll need to decide which settings are of the most interest to you. Because OTs work with clients of all ages, you should plan to observe therapists working with children, adults, and elderly people in multiple settings to learn about the various interventions and tools therapists use in each setting. Contact the facility and set up a shadowing experience. You may have to go through a “Volunteer Services” office, administrator, or other intermediary before you can get set up to observe, or you might be able to call or email the therapist directly. In either case, be prepared to introduce yourself, briefly state your goal for observation (applying to OT school, interested in learning more about the profession, etc. ), and ask how you can set up observation hours.At this point, the person you contact will either tell you they aren’t able to accommodate you (don’t give up!) or give you a laundry list of things you’ll need to do in order to be able to volunteer (YAY!). Be persistent! When I was trying desperately to volunteer at a hospital’s outpatient pediatric facility, I was given the runaround for two weeks. Finally I got fed up and drove over to the hospital’s volunteer department and politely – but firmly – requested a meeting with the volunteer coordinator. In the end, I ended up observing in a fantastic setting with wonderful therapists and mentors, but it never would have happened if I hadn’t advocated for myself strongly. If the answer is no and the site simply isn’t able to host a student, accept your bad luck and move on to the next place on your list. However, if you don’t get a response after several days or weeks, don’t be afraid to follow up with polite phone calls or emails as appropriate. (Remember, therapists are busy people, so you might not get a reply the same day you reach out! Give a person 3-4 days to respond before contacting him or her again). You can observe the same clients over time. One of the most amazing things about being in a healthcare profession is getting to see clients improving. By volunteering at the same times or on the same days of the week, you’re more likely to be able to follow the rehabilitation journey of a few specific clients and build rapport with them. You get to see a wider variety of interventions. When you volunteer on the same two or three days of the week, the clinicians and staff come to expect and anticipate your arrival. In some cases, they may even plan to perform certain interventions, see specific clients, or demonstrate other interesting things on days when you are there to observe, if you express interest in seeing a certain procedure or treatment. You can observe multiple therapists. Variety is the spice of life, and seeing various therapists in action will add spice to your shadowing experience! Whenever possible, ask if you can follow therapists other than your primary supervisor to see how their approach may differ and get diverse perspectives on working with clients and practice issues. You become more of a “team member” and less of an “observer.” Over the course of several weeks or months at a volunteer site, coming regularly or on the same days helps you establish a relationship with the staff and clinicians. As a result, you might be asked to help complete various projects, develop resources, or get involved in another way that can expose you to additional aspects of the profession or setting and provide a valuable perspective that you might not otherwise have gained. Arriving on time and only on scheduled days. Dressing appropriately – check with your supervisor about the site’s dress code. Following rules about client privacy – don’t use real names or talk in detail about the clients you see when you leave the site. Helping out whenever you can – offer to clean equipment, organize filing cabinets, make copies, and do any of the little things that help keep the therapists happy and the site in good shape! Record your hours carefully. 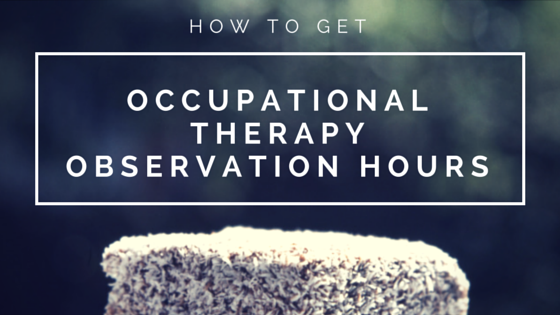 Although you don’t need to calculate every hour you spent at a site down to the second, it is important that you document the time you spent observing accurately, as you will have to provide this information for all of your OT school applications. It may be helpful for you to have a log sheet at the site, in your car, on your phone, or at your bedside to help you remember to write down your hours. Keeping an accurate record of your hours is also a building block for future professional ethics – so be honest! Give thanks. This is a crucial – and often forgotten – part of the volunteering experience. At the end of your time, give a handwritten thank-you note to your supervisor and/or other staff members that had an impact on you. In settings where you observed with multiple therapists or staff members, you can either write a thank-you card for all of the staff in general or each individual team member. If you had a strong relationship with your supervisor, it may be appropriate to give a small gift, such as a gift card to a favorite coffee shop or a package of his or her favorite candy. And while giving gifts is definitely not required, giving thanks certainly is! Keep in touch. Building a professional network starts the moment you set foot on site. If you had a positive relationship with the staff, don’t hesitate to send an occasional email letting them know where you are in the process of applying to OT school or where you got in, after you make a decision. Many supervisors like to hear about where the people they worked with ended up, and keeping in touch can be a great way to build connections as you begin your career. Choose another population and setting and start over! Volunteering in multiple places is the best way to help you make an informed decision about your potential career path and areas of interest, but having a diverse range of experiences serves an even more important purpose. By observing in multiple places, you demonstrate to admissions teams that you are committed to learning about multiple aspects of the profession, not just the one that you think you are the most interested in. Even if you know you want to work with kids forever, spending 20 hours with an OT in a setting with adults can expose you to another practice area you love, at best, or deepen your commitment to pediatrics, at worst. Additionally, having a diverse range of experiences will help you learn more about which practice areas might be a good fit for you and give you more material to include in future essays and applications! Observing therapists, getting to know clients, watching progress, and asking questions was hands down my favorite part of the OT school application process. Now that I’m in school, I don’t have hardly any time to observe therapists outside of my brief Fieldwork I placements or occasional class field trips to various sites. Before you apply to OT schools, I encourage you to spend as much time as you can observing different OTs at work to learn about the true depth and breadth of the profession and help determine whether or not it’s the career for you! By following these 10 steps, you can help ensure that you have a positive and informative OT shadowing experience! NOTE: While it is important to get observation hours in a variety of settings, make sure you read each program’s admission requirements very carefully to ensure you have the correct number of direct observation hours with an OTR or OTA. This means making sure that your supervisor or the person who you are observing with is a licensed therapist, and not another type of professional (i.e. a PT, a teacher, etc.). Conducting an Informational Interview: If you don’t have time or can’t coordinate schedules with a practitioner in an area you’re interested in, consider conducting an informational interview instead of shadowing. This likely can’t be counted as shadowing hours, but it can help you learn more about a particular practice setting. Traits of a Good Fieldwork (or prospective OT) Student: This link has a list of the qualities that make fieldwork students – or prospective OT students – stand out when they are observing or on fieldwork. Clinical Observation Guide: Indiana University at Bloomington has a GREAT guide to making the most of your clinical observation experience, with helpful advice about how to log your hours, record important observations, and interact with staff on site. I am not 100% sure of the answer to that question. I highly suggest that you get in touch with the admissions coordinators at the OT programs you plan on applying to and asking them whether hours from an OTA fieldwork experience count, to be sure that you’re including accurate information on your applications. Wow, thank you so much or this comprehensive posting. I feel so much more confident and motivated having read this. My curiosity for OT was just recently peaked and this will be a wonderful guide as I begin to look into the profession. I’m super excited to get started – thank you! Thanks for commenting! I’m glad you find the blog helpful, and I hope you enjoying exploring OT as a potential profession! How did you record your observation hours? I’m finding that some schools have their own forms while others give no indication. I don’t want to make the site supervisor sign 8 different forms each time I observe. is there any type of specific logging of the hours that you recommend? I am just starting to do observation hours and want to make sure I do it correctly. Hi Chloe! Thanks for commenting. I didn’t have any special system for documenting observation hours beyond a spreadsheet with columns for the date, hours observed, therapist observed, and signature space. Many sites also have their own specialized forms for documenting observation hours, so be sure to ask your supervisor if anything currently exists at your site(s)! I can say that it is EXTREMELY important to document your hours accurately, as many OT school applications (including OTCAS) requires you to input a specific number of hours and you want to minimize guesswork when that day comes. Have fun observing! Excellent information! I am in the process of applying for a Bachelors degree to meet prerequisites to Major in OT. This is extremely helpful information. I’m glad you found it helpful. Best of luck working towards your Bachelor’s degree and a career in OT!